IPL 2019: At the time of filing the copy, KXIP was 11/0 in 3 overs. 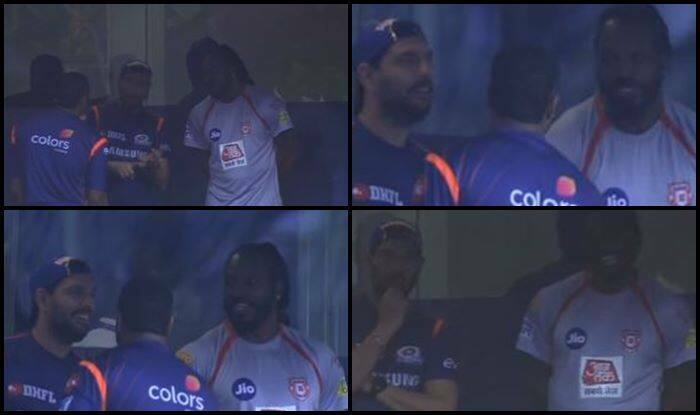 IPL 2019: Mumbai Indians star cricketer Yuvraj Singh caught up with Kings XI Punjab cricketer Chris Gayle ahead of the blockbuster at Wankhede. Once teammates, the two cricketers are now facing each other. Yuvraj is a former Kings XI Punjab cricketer where Gayle is still a part of. Ahead of the match, the two mates looked in high spirits as they laughed and smiled in the dressing room giving fans a reason to cheer. It is a big match for both the teams at this point of time in the tournament. Meanwhile, Mumbai won the toss and opted to field. Keiron Pollard is leading the Mumbai in the absence Rohit Sharma, as he is nursing an injury. Siddhesh Lad in the meanwhile is making his IPL debut. “We will bowl first because of the dew factor. We don’t think wicket will change much here at the Wankhede stadium. Rohit is fine but as a precautionary measure we have decided to give him as a rest. Siddhesh lad comes in place of Rohit. He has waited for 5 years to make his debut. Joseph was special for us in Hyderabad and it was a tough team meeting,” said Pollard at the toss. “We would have bowled first too but teams have defended well on this track. We have a forced change in our team, Mayank has not recovered from his finger injury so Karun Nair will replace him. And Hardus Viljoen also comes back in the team. He will replace Mujeeb. Spinners have struggled to bowl 8 overs on this pitch so we have added an extra seamer,” said Ashwin at the toss.